Your parents, guidance counselor, and teachers were right: you don’t get a second chance at a first impression. This is why The Crown will always be a wonderfully over-the-top and high energy death-tinged thrash band to my ears. Deathrace King introduced me to their work, opening with the perfectly titled “Deathexplosion.” Johan Lindstrand’s shout of “FIRE!” over a fast, aggressive, and simple riff sold me on the band and their brand of metal immediately. The upshot here is that The Crown works best for me when they’re being utterly ridiculous in speed and content. With this in mind, my reaction to their seventh studio record being called Cobra Speed Venom was, to say the least, positive. Having never written about them, I’d never paid much attention to what The Crown sounded like in reviewer’s terms. 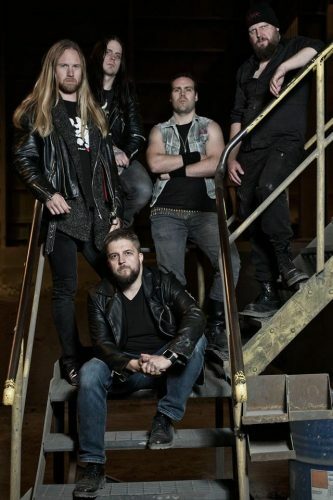 Cobra Speed Venom has a backbone of fun thrash via Witchery, the hyper-speed early death metal ethos of Vader, some melodic tendencies from the Gothenburg scene, and the hard-rocking heart of Motorhead and Venom. Fast, fun, and loud are the name of the game with The Crown, and Cobra Speed Venom plays it well. While other bands are surely technically faster in beats per minute, The Crown has a habit, like Vader and Slayer, of making their stuff sound faster and more energetic than many of their peers. This aspect was partially yet conspicuously missing on Death is Not Dead, but has been regained here. Surprisingly, Cobra Speed Venom opens with “Destroyed by Madness,” a quality and quintessentially Swedish death metal song more in the vein of Vomitory than normal. It’s a ripper, but it doesn’t bear the fun factor of proper openers like “Deathexplosion,” “Headhunter,” and “Crowned in Terror.” Even the solo is more traditional death metal than The Crown’s usual almost obnoxious guitar heroics. Suddenly, with a mere twenty seconds remaining in the song, we hear that fun Motorhead/Witchery aspect forced to the forefront, leading expertly into the excellent thrashing of “Iron Crown.” The long-con strategy works spectacularly well, making for a memorable and forceful introduction to the record. “Business as usual” and “effortless” both carry negative connotations, but for The Crown they’re something of a modus operandi here. Cobra Speed Venom is exactly what we’ve come to expect from The Crown, but fortunately great songwriting and an emphasis on riffs are baked into the equation. “Necrohammer” is a good example. Like “Deathexplosion” before it, the ridiculous portmanteau is expertly worked into an unforgettable chorus and the guitars spend the duration in a frenzy of typically energetic and memorable The Crown riffs. Attention must be paid to new full-time drummer Henrik Axelsson, who brings back the speed and ferocity of Janne Sarenpaa in a far more convincing way than Marko Tervonen’s efforts on Death is Not Dead. Cobra Speed Venom simply sounds faster and more ruthless than its predecessor largely because of Axelsson’s performance. The big, fat, modern, and utterly unfitting production of Death is Not Dead has been largely done away with on Cobra Speed Venom, so the whole affair sounds leaner and meaner. It’s not as dynamic as Deathrace King, but sounds looser, more alive, and more agile than its predecessor nonetheless. The Crown’s glory days aren’t yet behind them, but it’s simply not possible for Cobra Speed Venom to blow Deathrace King or Crowned in Terror out of the water; it hasn’t been around nearly as long, the scene has gotten bigger, and the spins afforded to those earlier records likely won’t be matched by fans for quite some time, if ever. 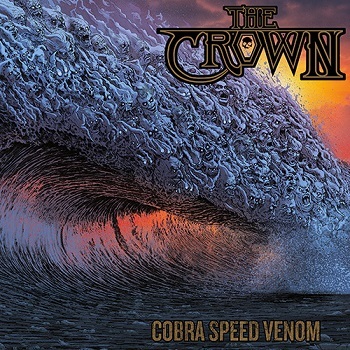 While this may seem to render Cobra Speed Venom superfluous, rest assured it’s not; the speed, the excitement, and most importantly the riffs are still here, and The Crown have given us another ripper with no low points to speak of. Along with Visigoth’s sophomore record, The Crown have released one of the most quintessentially metal things I’ve heard this year; the undiluted focus on riffs, guitar pyrotechnics, and good old-fashioned aggression is a joy to behold. Cobra Speed Venom is the sound of a band fighting for their continued relevancy and winning, storming into The Hall and forcefully declaring that they don’t want to be anywhere but here, reveling in their riffs and ridiculousness. Naturally, I wouldn’t want it any other way.